It was the longest project I have ever attempted in my entire life. 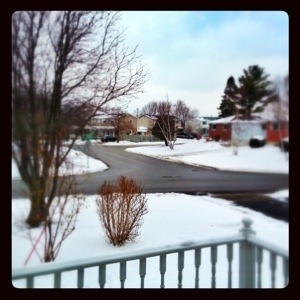 A photo a day for one whole year – and a leap year at that. When my good friend Lynn (Note-ables By Lynn on Flickr) challenged me to this project I took it on thinking no one would actually complete it. Well, here it is, 366 days in and this is my final post for the series. I decided it would be fitting to replicate my first image in the series, even without a title other than the day number. I hope you enjoyed this trip around the sun with me as much as I enjoyed doing it. I plan on making a video sequence of all the images and posting it on Vimeo so stay tuned for that. Lynn, if you’re reading this, thank you for the inspiration and the challenge. It promoted creativity and perseverance, both of which I sometimes lack. I never would have dreamed of doing something like this had you not suggested it. This challenge was indeed difficult at times but it was in my head literally every day of 2012. Happy New Year to everyone and God Bless you all. Some very well known, very reputable celebrities have expressed their belief that there are many ways to get to Heaven. I believe there is only one way to Heaven. And that is through the Lord Jesus Christ. But what does that mean, “through the Lord Jesus Christ”? The premise here is that Christ shed his blood on the cross for our sins, but that sounds like He did it for us. Well, yes, Jesus did indeed die on the cross for us, for our sins, but there’s more to it than that. And not too many people know the whole story here, myself included. But I think I have a better understanding of it now, especially after hearing a sermon from Dr. Charles Stanley from In Touch Ministries. His message about the death of Christ on the cross and what the cross symbolizes was most interesting and intriguing. Jesus was put through the most barbaric, horrible torture anyone could imagine. He was treated like a criminal, or worse, because he told everyone that he was the Son of God, and His Father was not from an earthly place. Plus, He was betrayed three times by His own disciple, Peter. So what price did Christ pay for this? What did he go through? The barbaric act of crucifixion was invented long before Christ was born. At the time it was the most vicious, cruel, painful form of punishment. The process was handed down from the Barbarians to the Greeks and eventually to the Romans. Crucifixion was so intense that the Romans could barely stand to perform it on their own people. Think about it; think about how Jesus must have been treated during His crucifixion. I mean, no, I obviously wasn’t there when these events took place, but research has shown that the Romans had little compassion for rebellious leaders, and Jesus was claiming to be the King of the Jews. I can imagine He was whipped, kicked, thrown to the ground, insulted, and struck profusely. And that was likely before He was given His sentence. There was great misunderstanding of the messages that Jesus was presenting to His followers. His followers didn’t necessarily misunderstand His message of the Messiah, but rather His enemies most likely created their own version, or gave misdirected meaning to the prophesies regarding the coming of the Messiah. Whatever the case may be here, Christ was treated very cruelly, and He knew it was coming (Matthew 20:28). When Jesus was presented to Pontius Pilate for sentencing, Pilate could not see where any law had been broken, and he had the authority to free Jesus, but, as governor, he also wanted the support of the Jewish leaders. However, Caiaphas, a Jewish high priest, was adamant that Jesus was blasphemous. Pilate even went so far as to send Christ to Herod since Herod was the ruler of Galilee, which included Jesus’ home town of Nazareth, but Herod passed sentencing back to Pilate. Christ’s ultimate fate appeared to be determined by Pilate, who reluctantly gave in to Caiaphas and his peers. I say “appeared” because that’s how things looked to the people who didn’t believe in Christ’s deity. The fate of Jesus Christ was determined by God, and as mentioned earlier, Jesus knew it was going to happen. Jesus is often referred to as the “Lamb of God”. The lamb was used in sacrificial offerings to God since the time of Cain and Abel, and Abel’s offering of a lamb to God, the shedding of the lamb’s blood, was the remission for Abel’s sin. And through this sacrifice, Abel was acknowledging that he was a sinner. God accepted Abel’s sacrificial offering of the lamb, but the blood of that lamb, and the blood of the many sacrificial lambs that followed through history, could not save us from our sins. Jesus Christ was God’s lamb, God’s sacrifice for our sins. Jesus was the last lamb to be offered to pay for sin. The blood of the Lamb of God flowed not just on the day of the crucifixion, but flowed back to the time when Eve disobeyed God, the first sin, and continues to flow up to the present and beyond. He paid the ultimate price for us. All of us. No one was left out. But our acceptance into Heaven will not be granted unless we believe by faith that this is true. In John 14:6, Jesus said, “I am the way, the truth, and the life. No one comes to the Father except through Me.” Through, by definition, means passing from one side to another. We must make the journey from this world to Heaven through Christ. I wear a cross around my neck as a symbol of my acceptance that Christ died for my sins. It reminds me daily of the torture, the pain, and the blood that was shed for me. And I can look at it as though it was done for me personally, just like each of you can. Because it was. There was a time when I would say nothing nice about Facebook. I used to think it was such an invasion of privacy and I really couldn’t understand what the big draw was to the site. I was so put off by Facebook’s privacy polices that after numerous threats of doing so, I finally left the site. But then I realized that once I was in a world without Facebook, I was kind of left put of the loop. I think a site with over half a billion active users says something. And it just so happens that most of the family members and friends I know are included in those half billion users. So now, I’ve decided to embrace Facebook – albeit in a very careful and cautious manner – and use it as a more productive communication tool. It is becoming very evident that the people running Facebook are not just running the largest social network site on the planet, but they are honing it into a fully evolved web based platform. There won’t be much you can’t do online that won’t have Facebook’s touch added to it in some way. I guess that’s a good thing, right? I mean, I don’t know, that’s why I’m asking. You click a Like button that Facebook has placed on a web site, and the next thing you know, you get an ad on your profile page that is relevant to what you liked. I guess that’s better than seeing an ad about something you don’t like. I was dead set against using that Like button but now I’m not so sure. I must say, three are ads on my profile page that I could care less about so maybe I should start “liking” stuff. Facebook Places. There’s another thing I dreaded the thoughts of. But I thought what the heck, if I’m going to enjoy the Facebook experience, I might as well jump in with both feet. Its not like I’m broadcasting to the whole world my whereabouts, just those I care about. And if you’re on my Friends list, you’re cared about. Besides, if Facebook Places catches on and more of us use it, I could check into somewhere and find one of you there. It actually betters the chances of a – chance meeting. In closing I would like to mention that I’m not afraid to admit I was wrong about Facebook. Sometimes you just have to give in to the masses. And when the masses are five hundred million strong, one little opinion like mine doesn’t stand a chance. On Saturday, July 17, 2010 I was blessed with the opportunity to attend a large family reunion graciously hosted by my parents at their home, which just happens to be where the Ruth family grew up. My Mom was a Ruth girl, and after witnessing the shenanigans at this reunion, she’ll always be a Ruth girl. See, she comes from a large family, hence the tag “large” family reunion. It was so good to see so many of my aunts, uncles and cousins. And for that matter, I met cousins I never knew I had. It was ten years since the last reunion and unfortunately I missed it due to work. My Dad is a real trooper. He and Mom planned this event and I couldn’t thank them enough. A big thanks goes out to all who chipped in to make this one of the best days ever. Cousin Jerry and his sidekick Dr. Glen and their relentless determination to make sure the beef was cooked in a timely fashion did not go unappreciated. Aunt Anne, everyone, I can’t think of all those who lent a hand, Thank You! My hero is Jesus Christ. But on this planet in this life my heroes are my parents. Thanks for a great time. I don’t know that its enough, but I tried to make some of the memories of the day last forever with a collection of photos. It was so hard to get a lot of photos but between gab sessions and re-acquaintances I managed to get 100+ pictures that are now up for viewing on Flickr. You can see them by clicking HERE. Amazingly, and again with some well executed assistance, I was able to get most, if not all, in attendance at the time together for a big family portrait. Below is a sample, and soon I’ll have a version posted (somewhere with a private link) for family members to download and print. Last year we lost a dear friend and a wonderful person. On what would have been her birthday in March, her son Rodney posted a video on YouTube as a tribute and a memorial to his Mom. Eleanor, or Aunt Eleanor as she was known to so many, was a fun, life loving, kind hearted person, and boy could she cook! I had the pleasure of knowing Aunt Eleanor for ten years and I cherish every one of them. Click here to see the video on YouTube. Watch and enjoy a trip through Aunt Eleanor’s life as she waits for the rest of us to catch up to her. The photo below isn’t the exact image Pastor Hagee showed on TV but it’s the same place. That place is an area just north of Jerusalem that Hagee says, and I believe, is an impression on Earth made by the hand of God long before the creation of Adam. Hagee believes that it is God’s “signature” because of how it strongly resembles God’s name – Jehovah – in Hebrew lettering. 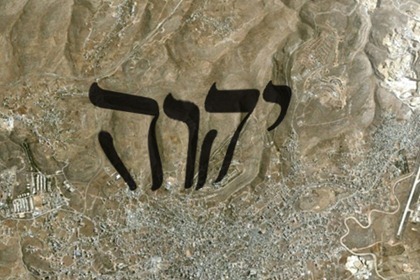 It took me a couple of hours to figure out just where this was because it is actually rotated about ninety degrees to the left so the top of the image is pointing west, and when you look at the area surrounding Jerusalem in a satellite image, there are a lot of lines made from hills and mountain-like terrain. The key to seeing the resemblance of this scene to the word “Jehovah” in Hebrew is to compare the above image to the series of images below where I’ve incrementally blended the text with the lines of the terrain. I don’t know about you, but I truly believe there’s something to this. If memory serves me, Pastor Hagee said this is the same place where Moses went and saw God face to face when he was given the Ten Commandments. Don’t quote me on that because after seeing the image on TV my mind was racing trying to figure out where I could find this image and I don’t recall much of the sermon after that point.